Thanks to Doc for informing me about this story. 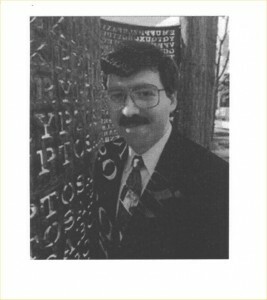 Above is CIA analyst David Stein, the first person to crack encrypted messages in the Kryptos sculpture at the CIA, leaving only one message unsolved. Twenty-three years after the sculpture was created, the last message still remains unsolved. Wired.com posted this story recently, triggered by the NSA widely distributing Stein’s declassified and fascinating account of how he tackled Kryptos for over seven years using only pen and paper. Although Stein was first, his work was only known to CIA colleagues. Cryptographer and computer scientist Jim Gillogly was the first to publicly announce the correct solutions, but he was unaware of Stein’s work. Gillogly is also known for identifying a strange sequence in one of the Beale cryptograms, which he explains is evidence that the Beale papers are a hoax. Read more about how Stein cracked Kryptos here. And be sure to read Elonka Dunin’s nicely organized breakdown of the entire Stein article. Those of us working on the 340 might find some insight and new ideas in such details.